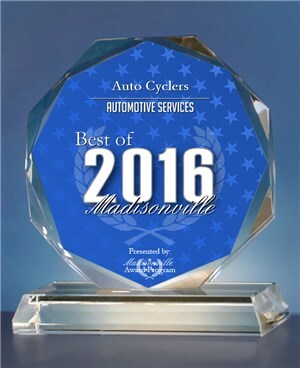 AUTOCYCLERS IS PROUD TO BE RECOGNIZED AS THE BEST MOTORCYCLE DEALER IN MADISONVILLE, TN BY THE US LOCAL BUSINESS ASSOC. We specialize in late model sports & cruiser bikes! On this site you will be able to view a lot of our bikes that are currently for sale. Some are perfect and others need a little fixing up. Just click on the categories on the upper left side of the page to link to closeup pictures of the bikes. For example, if you are looking for a Honda F4i just click on the 2002 HONDA F4i link. The same goes for all of the other links listed.